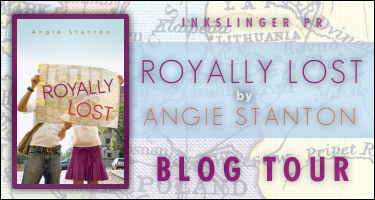 Welcome to my stop on the Royally Lost blog tour hosted by InkSlingerPR! 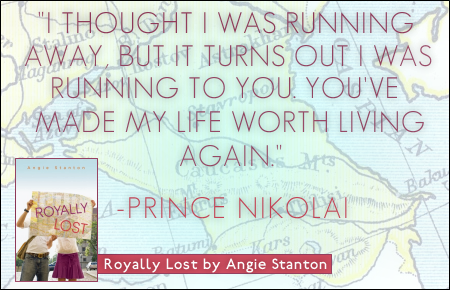 Angie is offering signed copies of ROYALLY LOST via the indie bookstore near her, and they are doing online orders (yay)! 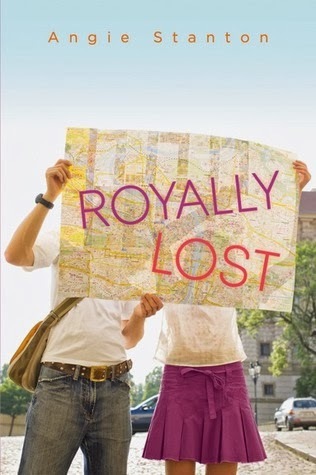 When I first saw Royally Lost pop up in the blogosphere, I knew I had to have it. Traveling across Europe? Meeting a cute boy who happens to be royalty? Yes please! While this was a really cute read, I did find the plot and writing style to be a bit on the juvenile side. I feel this book would be a big hit in the 12-15 age range. Pacing: I felt it was well-paced for the most part. There were a few instances where I was ready to skip forward to see more of Nikolai and Becca together. I suppose I'm a bit like Becca- reading about how she goes to museums and learning about history isn't quite my cup of tea so I was ready to move on to their reckless fun together. I did feel the writing style could be a bit on the abrupt side. The transitions didn't flow as seamlessly as I would have preferred. While I took note of this, it wasn't something that made the story unpleasant or impossible to get through. Storyline: Royally Lost had a really cute storyline. Becca is traveling with her family on a riverboat trip across Europe and is pretty unhappy about it. She's not really into the historical tours and spending time with her distant father and rather annoying stepmother. Her brother is the rebellious one and is the one who pushes the limits as to what he can get away with. Becca also hasn't had the easiest year. Her boyfriend broke up with her for her best friend and she is attending the same university as him. Meeting Nikolai is obviously one of the highlights of Becca's trip. Not only does she meet an incredibly hot guy, but he is actually really into her. Fate keeps placing them in each other's paths and soon the two find they can't stay away from one another- and will break all the rules to do so. Characters: I can't say I really connected with the characters on more than a surface level. They didn't have a whole lot of depth to them, which I typically prefer. As I said before, I just felt they were a bit juvenile for me and their relationship progressed to the 'I love you' stage rather fast. As I said earlier, Becca is pretty unhappy about being forced on this family vacation and I can't say I blame her. She's about to go off to college and yet, her dad and stepmom act like she's 15 or 16. That irritated me a bit because I would have told them exactly what's up. That isn't Becca's character though. She's always followed the rules and done her best to make her parents happy. After losing her mother to cancer, Becca's dad has been distant- focusing on work and not really seeing Becca and taking into account what she wants to do. She's attending Northwestern because he wants her to and she doesn't start thinking about her options until she meets Nikolai and realizes she wants so much more. I am proud of her for standing up and making the right decisions concerning her life and future plans. Nikolai can relate to being suffocated by his parents also. As the Crown Prince of Mondovia, he obviously has a lot of expectations placed on him and he is not happy. He feels Mondovia is not progressing the way it should and feels a lot of practices and customs are outdated. His parents however, won't listen to him, which fuels his need to get away. Most people would consider his actions childish and irresponsible, especially being in the position he is, but he's still young and wants his freedom, even if it's for a short while. He never planned on meeting Becca, let alone falling for her, but he is drawn to her and enjoys spending time with her. Together, they are a bit reckless and crazy- breaking rules and hiding from their respective parents. Still- it's the crazy beautiful that makes life worth living and those two really embrace it. Dylan, Becca's brother, was another great character. He is glad that Becca is spending time with Nikolai (though he does warn him if he hurts her, there will be hell to pay), as he never thought Becca's ex-boyfriend was good enough for her. He is a good partner in crime to have and Becca is lucky he was there or that trip would never have turned out the way it did without him to cover for her. Final Thoughts: I try not to read these types of books with too much of a critical eye. I am older, so when I see that Becca has gone off with a guy she's just met in a foreign country, I don't sit there and wonder what's wrong with her and who taught her common sense. (Because honestly- running off and kissing a guy you met in a foreign country is a bit cray-cray) I read the story for what it is- a light, cute read with a fun setting, a cute prince, and the sweetness of two teens falling in love. I had some of the same issues as you, but at the end of the day I simply thought the book was adorable and took it for what it was. It was exactly what I needed at the time and I loved all the fluffiness to the story. Great review! Haha, yeah, traveling stories tend to be all light and fluffy, and a bit unrealistic. It's good you enjoyed this one. This does sound like a cute story with a cute story line, but I would definitely have issues with the as well from the sound of it. I'm a major pace person.. It's gotta be done right for me to enjoy a book! Glad you did enjoy it though! Hmmm....this doesn't seem like a book I would jump at reading, but maybe a nice change of pace. Thanks for the review! Great review! This one didn't do it for me. I couldn't get past the juvenile writing and I agree, it is definitely more suited for the younger crowd.